Morning sickness is the worst! It can make enjoying your first trimester of pregnancy difficult to enjoy. If you are suffering from constant nausea and just can’t get a handle on it, there might be some things you are doing (or not doing) that is making it worse. 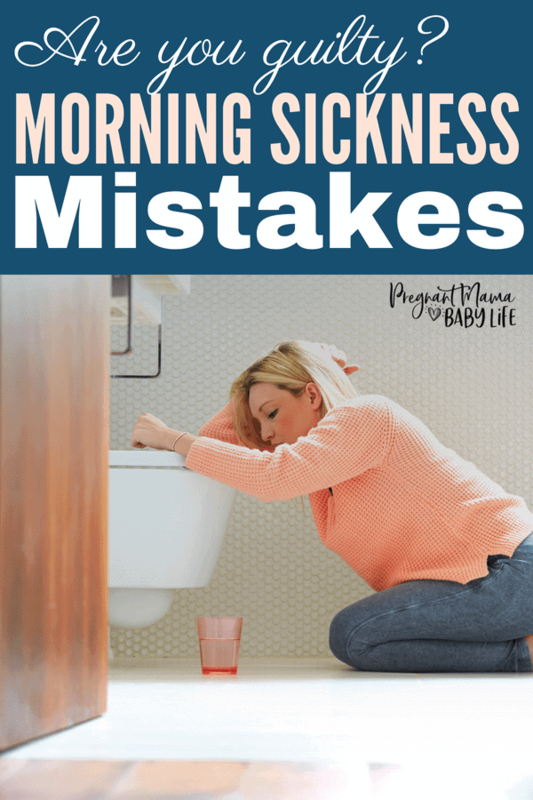 Here are some all too common mistakes to avoid if you are really struggling with morning sickness. The first mistake you need to avoid if you are pregnant is not eating enough. This may seem strange because when you are having nausea from your pregnancy, the last thing you want to do is eat. However, it’s important to get as much nutrition as possible, even when you’re sick. After all, you are growing an entire human. Try to eat small amounts of bland foods to start with, like crackers or dry toast. This can help stop the nausea long enough for you to eat actual food. During the times of the day when you are not experiencing any nausea, get a little more nutrition, focusing on fruits and vegetables and whole grains. Don’t forget your prenatal vitamins, and remember that avoiding food is only going to make your nausea worse, not better. Another all too common mistake when you’re pregnant, especially when you have bad morning sickness. If you are getting nauseated frequently and constantly vomiting, you’re losing electrolytes and fluids. Make sure to replenish the fluids you lose by drinking more water and drinks containing electrolytes, especially if you aren’t eating much due to bad nausea. Coconut water is a great drink that can help replenish electrolytes. An easy and tasty way to stay hydrated is making coconut water popsicles with fruit in them. Bonus points if you work in some ginger (a common natural remedy for nausea). Talk to your doctor if you think you might be dehydrated. When you feel up to eating, it can be tempting to gorge yourself on your favorite foods, but this might do more harm than good. Just because your nausea disappeared for a day two doesn’t mean it wont come back with a vengeance. Take it slow and add a few things at a time. Start with simple carbs and add in easy to digest fruits. Don’t go straight to your favorite enchiladas. The greasy, heavy foods can cause trouble, and you never know which spices or seasonings are going to upset your stomach. There are many natural remedies that can help you relieve your morning sickness. Something as simple as ginger tea can be incredibly soothing to the stomach. They even have premade mixtures of herbal tea made specifically for morning sickness like this tea. I also liked wearing acupressure bands on my wrists to help prevent morning sickness. These are small things you can do daily, to help ease the nausea. There are many levels of morning sickness and pregnancy related nausea, from mild to severe. If you are not able to hold anything down, including liquids, for 24 hours or longer, you need to get to your doctor right away. You might have a condition called hyperemesis gravidarum, which is when you are vomiting a lot more than usual. This can cause dehydration and malnutrition, which is bad for both you and your baby. Now on to morning sickness remedies that work.